Recently, I went all in on the 36th President of the United States. All in. 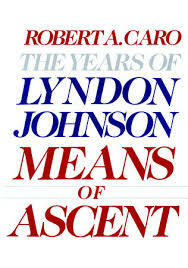 Committing myself to 3,522 pages describing and analyzing the life and times of Lyndon Baines Johnson. And that barely delved into his Presidency, which the author will cover in a forthcoming book currently in progress. Since starting, I haven't been able to stop gushing. All the way with LBJ! Before reading these books, I'd never visited a Presidential Library. I'd never wanted to visit a Presidential Library. But Lyndon got a hold of me! It all started after Ryan Holiday, a writer and commentator I admire, sang the books' praises repeatedly. I quibbled due to the commitment involved, but after leaving my job to travel last year, there could be no more excuses. I dove in. 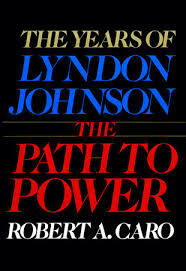 The Years of Lyndon Johnson series is the life work of author Robert Caro, now in his eighth decade -- the first book published in 1982, the fourth in 2012, with a final fifth installment in progress and expected in the coming years. Caro, who spent his formative working years as a reporter released his first book, The Power Broker about New York City planner Robert Moses, in 1974 and from there began work on his epic LBJ biographies, going so far as to move he and his wife to the Texas Hill Country for a number of years to be in the same area where Johnson grew up. Almost immediately after starting the books, I became hooked. I texted a close friend who I thought would enjoy the series and, as it turned out, he had just began reading the first book as well. Over the succeeding months we shared our growing mutual fascination with all things LBJ. Strangely, after reading 3,522 pages, we separately finished the fourth book on the exact same day. Lyndon works strange magic. These are books every American high school graduate should be made to read. I truly believe that. Not particularly because Lyndon himself is so interesting (certainly not worthy of emulation in most all respects) -- although he makes a fascinating character study as someone who came from very little and, through wild blind ambition and conniving, managed to take the highest powered office in the world -- but because The Years of Lyndon Johnson is a lens through which to learn about and view the events of the early to mid Twentieth Century that shaped much of the world we live in today. The first book, The Path to Power, covers Johnson's hard scrabble youth during the Great Depression of the 1930's and time as a U.S. Congressperson during Franklin D. Roosevelt's New Deal. The Means of Ascent examines the era surrounding World War II and concludes with Johnson being elected to the U.S. Senate in 1948 (by way of, there's almost no doubt, a stolen election). 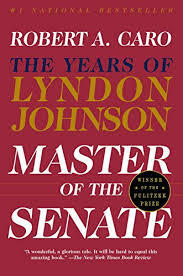 From there, The Master of the Senate focuses on Johnson's revitalization of the Senate as a lawmaking body, the dawn of the Civil Rights movement, and the booming post-war era. 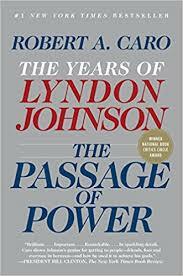 In The Passage of Power, the reader sees LBJ, hugely ambitious and riding high, blindsided by the country's changing mood at the outset of the John F. Kennedy era, then ultimately swept into power after JFK's assassination. He initially seizes control and power from the Kennedy men, notably from younger brother Robert, and ushers in his vision for a Great Society while, in the background, the military buildup in Vietnam is underway and foreshadows a calamity that will ultimately derail Johnson's legacy. 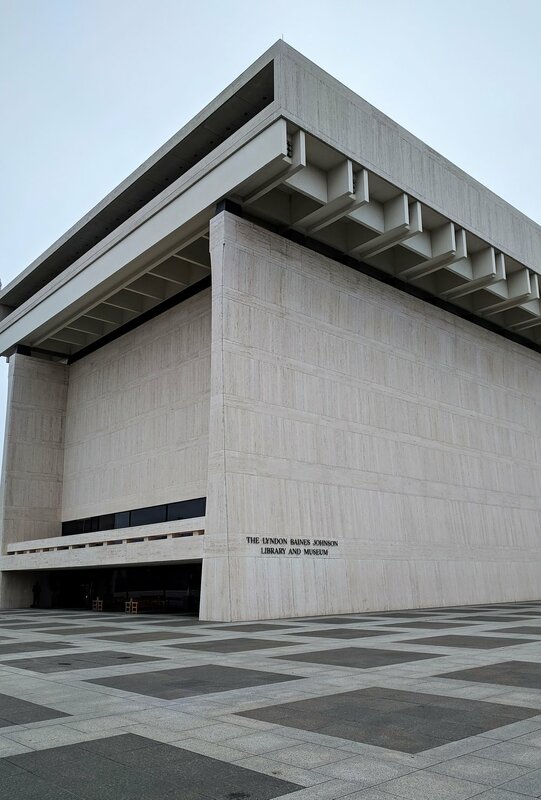 As I neared the end of the four books earlier this year, firmly at the peak of my LBJ hysteria, Nicole and I found ourselves in Austin, Texas, home of Johnson's Presidential Library on the University of Texas campus. What was a Johnson fanatic to do? Nicole, somehow still not as enthralled with LBJ as I (We had to invent a code word during our travels that Nicole could use to reign me in if I got too far off on Lyndon tangents; Nicole would say "bananas" and I would reluctantly wind down my fifteen minute sermon on, say, Johnson's civil rights efforts. ), agreed to the day trip. I will say this: The Lyndon Baines Johnson Presidential Library will only be of interest to the most die hard of LBJ enthusiasts. Pretenders need not apply. I found myself right at home among the sparse set of retirees roaming the halls pointing out Johnson's favorite cowboy boots or listening in on audio recordings of Lyndon's telephone conversations. Secretly, I hoped to bump into Robert Caro, who conducted much of his research for the books at the onsite Presidential Archives. But it was not to be. Mr. Caro, who lives in New York, must have had something better to do that gorgeous Spring day. Shortly after visiting the Library, I wrapped up the final pages (so far!) of The Years of Lyndon Johnson and have begun the process of moving on with my life. As I hope this post makes clear, I can't recommend these books enough. Hey, hey LBJ! Like this post? Want to read more about Travis and Nicole's travel, book, and wine adventures? Check out Nicole's Monthly Reading Dispatch - April 2018.